Hedgehogs are omnivores, with a large part of their diet consisting of insects in the wild. They are relatively new pets, so we are still learning more about them. At this time, however, we are still unsure of their exact nutritional requirements, and unfortunately there is not much research being done in this area, as hedgehogs have not yet been deemed an important market by the larger pet food manufacturers. We know that hedgehogs need a diet which is fairly high in protein (25-35 percent has been recommended), and a diet low in fat (stick with foods that are under 15 percent). A diet high in fat has been linked to the onset of fatty liver disease in hedgehogs. Also look for a kibble that contains no byproducts, artificial coloring, or preservatives. Most vets and owners will agree that a hedgehog's diet should include a variety of high-quality cat foods along with insects, fresh fruits, vegetables, and cooked meats. This helps to ensure that our hedgehogs are getting enough variety to meet their nutritional needs. Why a mixture of foods? A mixture of foods is recommended because some hedgehogs can be extremely resistant to changes in their diet. 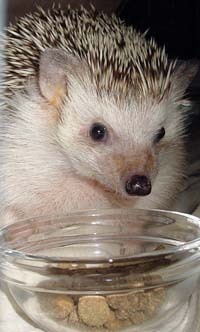 Should the food suddenly become unavailable or the manufacturer change its ingredients, you will have at least one other food that your hedgehog will continue to eat. Another reason goes back to the nutritional requirements. By picking more than one food, we are trying to fill in any gaps that a single food may leave in our hedgehogs' diets. 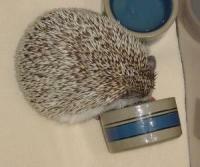 Most hedgehog foods, like many other pet foods, are either made from poor ingredients or are simply not appropriate. Some actually contain ingredients that can get lodged in your hedgehog's mouth (e.g., raisins and peanuts), and some are so nutritionally unbalanced that there have been hedgehogs that died from malnutrition while getting plenty of food to eat. While there are a couple on the market that can be mixed into your hedgehog's diet, I recommend instead providing a high-quality cat food, supplemented with insects, fruits, and vegetables. Dog food is generally not recommended as the kibble is often too large and harder than cat foods. Dog food is typically designed to be harder to crush since it is also designed to help clean a dog's teeth. A hedgehog's teeth are not nearly as strong, and such wear and tear can prematurely wear them down. As hedgehog teeth do not continually grow, once worn down your hedgehog will require a special diet of only soft foods in order to be able to eat. Information on treats and insects. How much protein and fat are in insects? More on pet foods: A compiled list of what really goes into cat food.